4/8 Cup of Coffee: On another rainy evening, only two Red Sox affiliates were able to get games in. 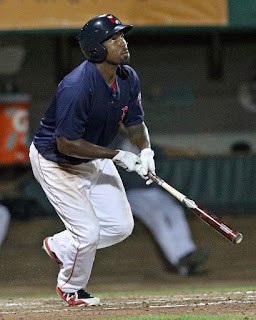 On a foggy night in Buffalo, Josh Ockimey's (pictured) eighth inning long ball highlighted a late-inning PawSox comeback. The Salem bats were quiet yet again as the Red Sox began their series with Lynchburg on the wrong foot. Greenville will make up their game in a doubleheader tomorrow, while Portland will play their makeup doubleheader in May. After falling behind early, the PawSox were able to storm back with five unanswered runs, including two apiece in the seventh and eight innings. Mike Miller and Tony Renda each had a major part to play in the come from behind win, each collecting two hits and adding a pair of runs and RBI's respectively. Juan Centeno added another two hits and Josh Ockimey capped off the comeback with a two-run bomb in the eighth inning, his first on the young season. On the mound, Ryan Weber got the job done in his first start of the year, surrendering just two earned runs over four innings while punching out four and walking none. Travis Lakins struck out three across two strong innings of relief on his way to earning his first win of 2019. Trevor Kelley and Jenrry Mejia closed the game out by combing for three scoreless innings, with Mejia grabbing his second save of the season. Portland was forced to call off its game Monday night, due to some rare April snow. The game will be made up on Friday, May 3rd at 5:00 PM. In a game featuring the two best pitching staffs in the young Carolina League season, Salem dropped its opening game of the series. Daniel Gonzalez took his first loss of the season despite a solid outing. The Venezuelan right-hander surrendered three earned runs while striking out three and walking three across 5 2/3 innings of work. Eduard Bazardo struggled in his 2 1/3 innings out of the bullpen, allowing five baserunners and giving up two runs (one earned). The Salem offense was unable to keep up with Lynchburg as no Red Sox batter recorded an extra-base hit. Garrett Benge and Tanner Nishioka each reached base twice with a single and a walk while Ryan Fitzgerald contributed two singles. The weather in Augusta was less snowy but still forced the game between the Drive and GreenJackets to be postponed. The game will be made up in a doubleheader today at 4:00 PM. Player of the Night: Josh Ockimey has gotten off to a slow start thus far in 2019, but his strong performance on Monday night can only help the left-handed slugger get back into a rhythm. On a quiet offensive night in the Red Sox system, Ockimey was the lone source of power and his first long ball of the season helped fuel a late PawSox comeback. Ockimey slugged a career-high 20 home runs in 2018 and will look to build on tonight's performance to match his 2018.